Oneplus 3 is the newest Android smartphone in the market and after the release of the phone, most of the developers are working on OnePlus 3 Custom ROM. Some of them already released some new custom ROMS for the Oneplus 3 and some of them released the TWRP recovery to flash these custom ROMs on the phones. Custom ROM has its features, most of them come with lots of customization and some battery improvements. 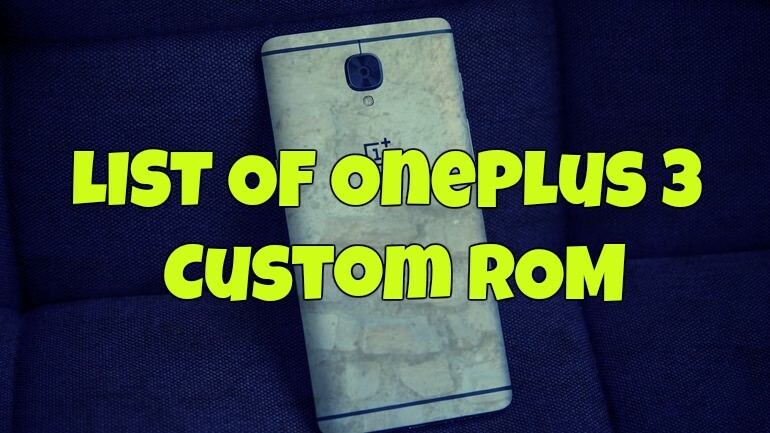 If you are the Oneplus 3 phone user and want to test dome of the best OnePlus 3 Custom ROM on your device, then you are at the right place. Here in this post, you will find some of the best working Custom ROMs for Oneplus 3 User, which you can quickly flash on your phone with the help of Custom TWRP recovery. If you don’t know how to do that and don’t worry, we are here to assist you on this. Here you find the list of OnePlus 3 Custom ROM and Google App zip file to flash on your phone. Before Flashing the phone do take the backup of your Oneplus 3 files and Data. Read all the steps very carefully and follow all of them step by step on your phone. a) Oneplus 3 with Unlock Bootloader. Read here how to do that. b) Rooted Oneplus 3 With TWRP custom recovery. c) OnePlus 3 Custom ROM Zip file. Download from the below mention list. d) Gapps Zip file package for Android 6 Custom ROMs. Download here. e) Nandroid Backup. If something goes during the flashing process, then you can quickly restore your previous ROM on your phone. Once the Oneplus 3 Custom ROM and GApps zip file are downloaded, Save both the zip files on your phone’s internal memory. And all you have to do is Boot your phone in Custom TWRP recovery mode and Flash both the files one by one on your phone. Here is the guide which you can follow on your phone to install Custom ROMS.